April 16, 2018 (Operation Rescue) – The criminal trial of an abortionist, Robert Rho, who caused the death of an abortion patient in 2016, is currently underway in the Queens Supreme Court in New York. Although it is a case that should be of national interest, few people are aware of it. That's because the trial is experiencing a complete media blackout. 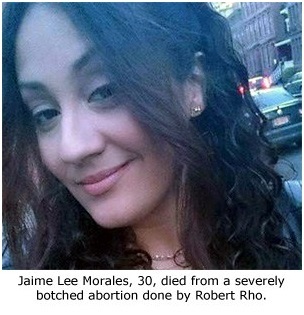 The trial involves the death of 30-year old Jaime Morales, who reported to the Liberty Women's Healthcare office in Flushing, New York, on July 9, 2016, for an elective second trimester abortion with clinic owner Robert Rho. A woozy Morales continued to bleed and even collapsed once at the clinic. Even though she was too unstable to release, Rho discharged Morales to her sister, and they began the drive to the sister's home in the Bronx. Along the way Morales fell off the back seat of the car and became non-responsive as a result of continued hemorrhaging. Rho was arrested and booked on October 11, 2016. He entered a "not guilty" plea during his arraignment the following day and was released on $400,000 bail. At first Rho appeared remorseful for his actions that led to Morales' needless death. He surrendered his medical license and closed his abortion clinic. A speedy resolution to the criminal case was expected. Today, Rho's trial before a jury of his peers continues in the courtroom of Judge Gregory Lasak, but no information about the proceedings is available outside appearance notices on the Court's web page. The trial is expected to run through Friday, April 13, 2018. "The trial delay resulted in the loss of what scant media attention there was in this case. We continue to follow it the best we can, but without being in the courtroom, it is impossible to know any details of the testimony and evidence, due to the media blackout," said Troy Newman, President of Operation Rescue. "When a woman dies from a negligent abortion, it simply doesn't fit the mainstream media's pro-abortion agenda. It's better for them to ignore it and act like it never happened. In a way, the media bears some responsibility for cases like this because they refuse to report on the true dangers of abortion." Operation Rescue has reported on this case since Rho's arrest in October 2016, and will report on the outcome of the trial when it is known.